Pracheth R, Mayur SS, Chowti JV. Background: Aging is a progressive stage beginning with conception and ending with death. Growth in the elderly population has led to an increase in age related diseases and mainly depression affecting quality of life. Depression in old age is an emerging public health problem leading to morbidity and disability worldwide. Aims and Objectives: To assess the prevalence of depression in elderly using the Geriatric Depression Scale (GDS), to determine the factors influencing depression and recommend preventive measures. Study design: A Community Based Cross Sectional Study. Setting: The study was conducted in the urban slums, field practice area of Community Medicine attached to a tertiary care hospital. Results: Prevalence of depression was 29.36%. Females (31.39%) were more affected than males (25.93%). 41 (64.06%) among those who were not working were depressed. 45 (70.31%) among illiterates were depressed compared to 19 (29.69%) literates (X2=6.664, df=1, p=0.0098, NS). (64.06%) among those not working, (60.93%) elderly belonging to low socioeconomic status and (54.69%) indulging in substance abuse had depression. Conclusions: Depression in elderly is highly prevalent. Quality health care of the elderly reduces the future burden of diseases and disabilities. 1. Singh A, Misra N. Loneliness, depression and socialibility in old age. Ind Psychiatry J 2009;18(1):51-55. 2. Kumar V. Aging in India- an overview. Indian J Med Res 1997;106:257-264. 3. Seby K, Chaudhury S, Chakraborty R. Prevalence of psychiatric and physical morbidity in an urban geriatric population. Indian J Psychiatry 2011;53(2):121-7. 4. Sandhya GI. Geriatric Depression and Related Factors-A Cross sectional Study from a Rural Community in South Kerala. Journal of The Indian Academy of Geriatrics 2010;6(2):61-63. 5. Kamble SV, Dhumale GB, Goyal RC, Phalke DB, Ghodke YD. Depression among Elderly Persons in a Primary Health Centre Area in Ahmednagar, Maharashtra. Indian J Public Health 2009;53(4):253-255. 6. Sherina M, Rampal SL, Aini M, Norhidayati MH. The prevalence of depression among elderly in an urban area of Selangor, Malaysia. The International Medical Journal 2005;4(2):57-63. 7. Barua A, Kar N. Screening for depression in elderly Indian population. Indian J Psychiatry 2010;52(2):150-3. 8. Romanelli J. The significance of depression in older patients after myocardial infarction. Journal of the American Geriatrics Society 2000;50(5):969-970. 9. Yesavage JA, et al. Development and validation of a geriatric depression screening scale: a preliminary report. J Psychiatr Res 1983;17(1):37-49. 10. Mahajan BK, Gupta MC. Social Environment. In: Mahajan BK, Gupta MC, ed. Textbook of Preventive and Social Medicine, 3rd edition, New Delhi: M/S Jaypee Brothers;2003:117-118. 11. Khattri KB, Nepal MK. Study of depression among geriatric population in Nepal. Nepal Med Coll J 2006;8(4):220-223. 12. Jain RK, Aras RY. Depression in Geriatric Population in Urban Slums of Mumbai. 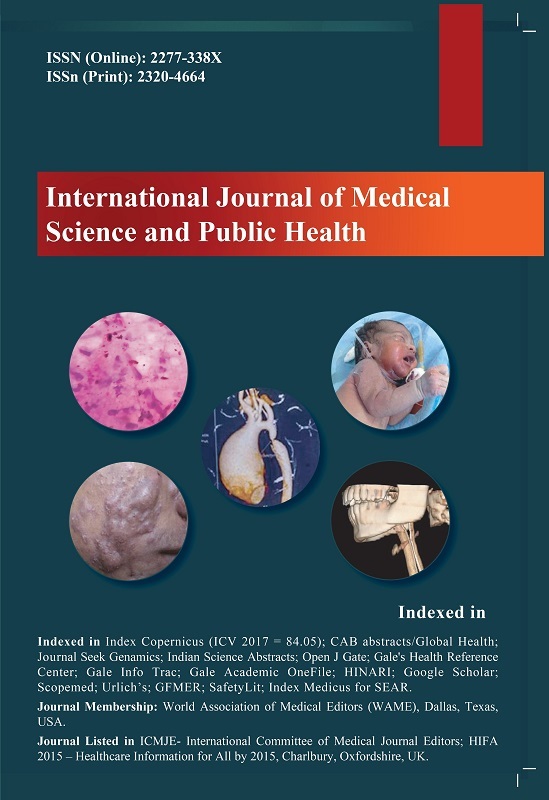 Indian J Public Health 2007;51(2):112-3. 13. Rajkumar AP, Thanagadurai P, Senthilkumar P, Gayathri K, Prince M, Jacob KS. Nature, prevalence and factors associated with depression among elderly in a rural South Indian Community. IntPsychogeriatr 2009;21(1):372-8. 15. Sood A, Singh P, Gargi PD. Psychiatric morbidity in non- psychiatric geriatric inpatients. Indian J Psychiatry 2006;48(1):56-61. 16. Korte J, Bohlmeijer ET, Smit F. Prevention of depression and anxiety in later life: design of a randomized controlled trial for the clinical and economic evaluation of a life-review intervention. BMC Public Health 2009;9:250.